Lovable Clayton and Desmond are back in this Easter companion to the bestselling book THE BIGGEST PUMPKIN EVER! 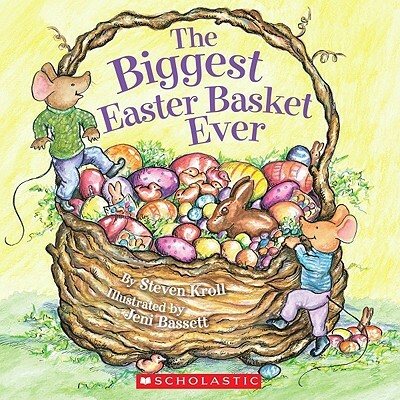 As Mouseville prepares for a gala Easter celebration on the village green, complete with a biggest Easter Basket contest, two lovable mice learn a lesson in cooperation -- and fun! Town mouse Clayton and country mouse Desmond continue to teach the benefits of collaboration and friendship in another sweet story centered around this joyful holiday. Steven Kroll was the author of over fifty books for children and young adults, including the New York Times bestselling The Biggest Pumpkin Ever. Jeni Bassett has illustrated more than thirty children's books, including The Biggest Pumpkin Ever, The Squirrel's Thanksgiving, and It's Groundhog Day. She lives in Altamonte Springs, Florida.